Butalbital 50mg, acetaminophen 300mg, caffeine 40mg. Tension (or muscle contraction) headache. Use lowest effective dose for shortest duration. Individualize. 1–2 caps every 4hrs as needed; max 6 caps/day. Also with Codeine: concomitant use or discontinuation of CYP2D6 inhibitors, CYP3A4 inhibitors or inducers: monitor closely and consider dose adjustments (see full labeling). Withdraw gradually by 25–50% every 2–4 days. Porphyria. Also with Codeine: children <12yrs. Post-op management in children <18yrs following tonsillectomy and/or adenoidectomy. Significant respiratory depression. Acute or severe bronchial asthma in an unmonitored setting or in the absence of resuscitative equipment. Known or suspected GI obstruction, including paralytic ileus. During or within 14 days of MAOIs. Risk of hepatotoxicity (acetaminophen >4g/day). Abuse potential (monitor). Discontinue at 1st sign of rash or any other hypersensitivity. Also with Codeine: life-threatening respiratory depression; monitor within first 24–72hrs of initiating therapy and following dose increases. Accidental exposure may cause fatal overdose (esp. in children). Risk of life-threatening respiratory depression and death related to ultra-rapid metabolizers of codeine (esp. in children for post-tonsillectomy and/or adenoidectomy pain). Avoid in adolescents 12–18yrs with conditions associated with hypoventilation (eg, post-op status, obstructive sleep apnea, obesity, severe pulmonary disease, neuromuscular disease, concomitant drugs that cause respiratory depression). COPD, cor pulmonale, decreased respiratory reserve, hypoxia, hypercapnia, or pre-existing respiratory depression; monitor and consider non-opioid analgesics. Adrenal insufficiency. Head injury. Increased intracranial pressure, brain tumors; monitor. Seizure disorders. CNS depression. Impaired consciousness, coma, shock; avoid. Biliary tract disease. Acute pancreatitis. Acute abdomen. Reevaluate periodically. Avoid abrupt cessation. Severe renal or hepatic impairment (monitor). Ultra-rapid metabolizers (due to CYP2D6 polymorphism): avoid. Drug abusers. Elderly. Cachectic. Debilitated. Pregnancy; potential neonatal opioid withdrawal syndrome during prolonged use. Labor & delivery, nursing mothers: not recommended. Barbiturate + analgesic + methylxanthine. Concomitant other acetaminophen-containing products: not recommended. Increased risk of hypotension, respiratory depression, sedation with benzodiazepines or other CNS depressants (eg, non-benzodiazepine sedatives/hypnotics, anxiolytics, general anesthetics, phenothiazines, tranquilizers, muscle relaxants, antipsychotics, alcohol, other opioids); reserve concomitant use in those for whom alternative options are inadequate; limit dosages/durations to minimum required; monitor. Acetaminophen may cause false (+) urine test for 5-hydroxyindoleacetic acid. Also with Codeine: risk of serotonin syndrome with serotonergic drugs (eg, SSRIs, SNRIs, TCAs, triptans, 5-HT3 antagonists, mirtazapine, trazodone, tramadol, MAOIs, linezolid, IV methylene blue); monitor and discontinue if suspected. Avoid concomitant mixed agonist/antagonist opioids (eg, butorphanol, nalbuphine, pentazocine) or partial agonist (eg, buprenorphine); may reduce effects and precipitate withdrawal symptoms. May be affected by CYP2D6 inhibitors (eg, amiodarone, quinidine, fluoxetine, paroxetine, bupropion). Potentiated by CYP3A4 inhibitors (eg, macrolides, azole antifungals, protease inhibitors, grapefruit juice). Antagonized by CYP3A4 inducers (eg, rifampin, carbamazepine, phenytoin). May antagonize diuretics; monitor. Paralytic ileus may occur with anticholinergics. Codeine may increase serum amylase levels. Drowsiness, lightheadedness, dizziness, sedation, shortness of breath, nausea, vomiting, abdominal pain, intoxicated feeling; hepatotoxicity, serious skin reactions or other hypersensitivity (rare). Also with Codeine: respiratory depression, severe hypotension, syncope. 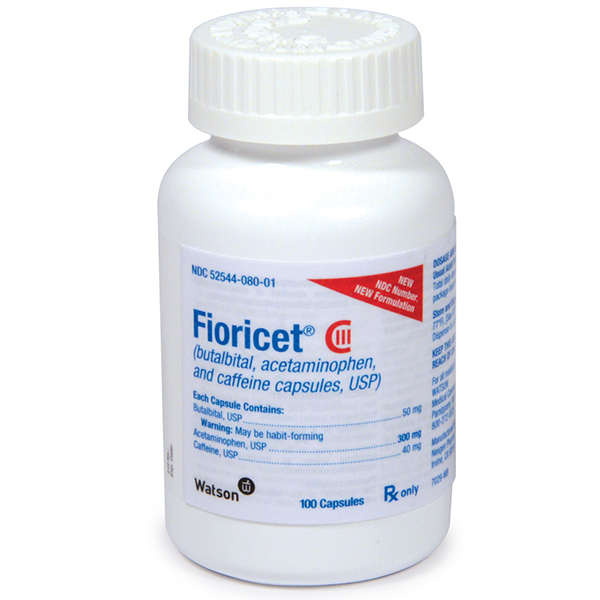 Formerly known under the brand name Fioricet.